Among the poetic voices of South Asia, Faiz stands unchallenged due to his eclectical vision and his modern imagery couched in a modern sensibility. In Lazard's translation, the heartbeat one feels is that of Faiz himself. Such an achievement is, indeed, rare in translations. At that time, only the translations by Kiernan were available, and Mahmood Jamal's Modern Urdu Poetry had just come out. Daud Kamal's_The Unicorn and the Dancing Girl_ would also appear the same year. Noted historian and polymath Victor Kiernan befrieneded Faiz while living in Lahore 1938-46. 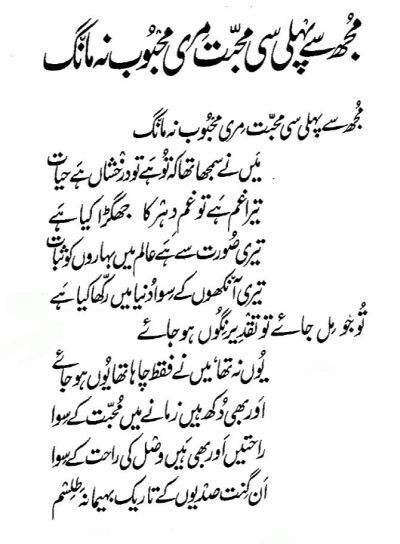 His Poems by Faiz, originally published 1958, updated 1971, remains the work of a master. His versions are transparent and let you inhale Faiz, but the aroma is not as intense as it is with Lazard. Lazard is definitely more economical, and her choice of phrase for many poems remains unmatched till today. work, attested very clearly in an earlier version of the Introduction. 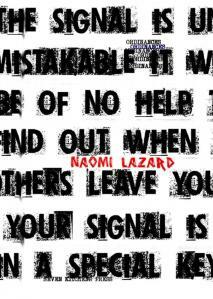 Naomi Lazard is perhaps one of the more under-rated poets in English today. Both are clearly anti-establishment, protest poets. everyone's lips. Perhaps Maya Angelou comes close, maybe Dr. Seuss. illiterate. Poetry is mass culture. poems themselves, without musical accompaniment. Tagore, they were not merely poets - they sought to transform society. reach him if I simply sent it to Faiz, Pakistan. people. They knew where to find him anytime. than sound pleasant. It needed to change society, transform lives. And perhaps even as you read these lines, it is doing that. composed music to his poems. life. He identified himself with the masses of the poor. Ritsos in the Middle East; and Faiz Ahmed Faiz in South Asia. in Honolulu in 1979 and continued until Faiz's death. And in 1979, Lazard mentions it to Faiz himself. where it turns on the way to oblivion. or look back over your shoulder. to hide you from me. wants to burst into flame again, let it happen. come — be close to me for a few minutes. we will know even better what we have lost. neither of us will mention our promises. Nothing will be said of loyalty or faithfulness. you can listen or not, just as you like. my eyes are lost, God knows where. who is a friend, and who an enemy. into my veins; hatred beats in it. of Moses with my eyes, my lost diamonds. When, having drunk from the gash of sunset, darkness comes. My tormentor, my love, be near me. whose walls are split open, the roof caving in. body smeared with ashes, forehead stained vermilion. The sky is bowed in timeless, silent reverie. Night will not deepen, daybreak will never come. for the skirt of time to tear itself away. it waits for a goddess to awaken, her dark veil cast off. Now you are here again - stay with me. that brings down for all time the oppressor's citadel. it will blacken them forever. and the singer's voice goes searching for its singer. or the last trump crying the hour of doom. each time the roses display themselves. The roses are also the blood of your lovers. intoxicated with embraces of moon-bodied beauties. when I believed life owed its luster to your existence. you alone could make me suffer. Your eyes were all there was of value anywhere. If I could have you, fate would bow before me. None of this was real; it was all invented by desire. and manna for the heart, beyond the realm of love. cheap merchandise on sale in every street. I must attend to this too: what can be done? Your beauty still delights me, but what can I do? Don't ask from me, Beloved, love like that one long ago. If I won you, fate would be at my feet. And other happiness than a fond embrace. Bodies that caked grime fould sand thick blood smears. Not be shut out, though your looks ravish still. Love, do not ask for my old love again. that your beauty would bring every spring to eternal bloom. And what else was there to cherish but your eyes? would not fate itself bow to me? feel? I wonder if it has too much of longfellow in it; i am happy with "don't ask". not a spot on his sleeve, no stain on the walls. no dye on the point of his bayonet. There is no sign of blood anywhere. celebrated later in script on some banner. no one had time or patience to listen to its cries. blood that in the end became the nourishment for dust. how crimson the blood in our veins! our boat would enter its haven. nor had the oars been properly tested. that river is still there; the same boat too. Now you tell us what can be done. You tell us how to manage a safe landing. All their quackeries were futile. You tell us how to heal our wounds. why he hasn't been stopped by a shout. the mirror stricken with longing for that lost reflection. on streets littered with the usual rubbish. someone will roll and unroll his loneliness. when the key to the prison of self has disappeared. It is the hour of renunciation when the festivities are over. "Where is there to go now?" No one belongs to anyone at this hour. Forget it. No one will receive you at this hour. Let it go. Where can you possibly go now? Even if you find someone you will only regret it. slashed by a razor streak of dawn. that mingles with the roadside dust. with appropriate mourning. Come, my people. We will celebrate the massacre of the multitudes. I have caused the ghost city known as Limbo to be inhabited. from night and from day. You desire something from dawn's first brushstrokes? Yuo make a wish on your bed of dreams? all eyes have been excised. I have sent all dreams to the gibbet. No bough will displayits wealth of blossoms. the embers of Nimrod's fire. will cover you with dust and ashes. Mine is the new religion, the new morality. Mine are the new laws, and a new dogma. will touch their lips to the hands of idols. to lick the dwarves' feet, and taste the clay. of beneficient deeds is bolted. when everything we were denied will be granted? and all sorrows will be over? Why not forget the fear, the danger? After all, what is inevitable cannot be avoided. if there are tears, they are equally acceptable. How will it be, the day death comes? can be heard on the silent windows. What will it be like, the day death comes? from one end of the world to the other. "Thank God it is finished, the night of the broken-hearted. the honeyed lips I have known." Hamilton/Kirkland College and at the University of Montana. She is also a past-President of the Poetry Society of America. wrote the screenplay The White Raven, and the play The Elephant and the Dove. (2007), and in Czeslaw Milosz's anthology, Book of luminous things (1996). of it being read by Garrison Keilor on NPR. poetry, has been virtually ignored... Why? Faiz seem to overcome the estrangemenwt ritten all over his face. exultantly to Zia, "We are here." such throughout the major part of Asia and Africa. find more of her translations. I also wanted to find out more about her. (Summer, Fall 1991), pp. 156-170; http://www.jstor.org/stable/40873227. inevitable in any attempt at translation. 1. "Tera gham hai to ghami dehr ka jhagra kiya hai." The grief you caused left no room in me for world sorrow. 2. "Teri ankhon ke siva dunya main rakha kia hai." Lazard's  translation: Your eyes were all there was of value anywhere. which is something like this: To me your eyes were the whole world. 3. "Aur bhi dukh hain zamanë main mohabbat kë siva." 4. "Rahatain aur bhi hain wasl ki rahat ke siva." feeling fulfilled  in life than through consummation  of sexual passion. raced to their end, leaving the bereaved country like a mother in mourning. for the poem's total impact. original. It sounds like an unnecessary addition. the shafts of pain have flowered  into dawn's coral streaks. is changed into sparks, light-ray  against light-ray. is my faith that morning will come. that case, after the fever and fret of life, death would come as a relief. However, the reality of death cannot be dismissed with a fanciful simile. lips I have known." This change makes the poem end on a positive note. Neither you nor I exist there. When, having drunk from the gash of sunset, darkness comes. . . .
"Doors and walls, crushed under the weight of silence"
"The weight of silence crushes doors, walls, windows." (4)  rang hai dil kā mire, "k.hūn-e jigar hone tak"
The sky sight's bound, the road a road, wine wine. Now you are here again--stay with me. till all melts into blood. the tint of poison, of blood, of sable night. The Sky, the Road, the Glass of Wine, page 14some ever-revolving mirror. the sky, vision-bound, the pathway, the wine-glass. poison color, blood color, the color of black night. a mirror changing every moment.